While we’re at the height of cricket season let’s take a quick look at an interesting object that the museum has on loan from the Menzies Foundation—the Menzies Memorial Cricket Trophy. This trophy is presented to the winner of the Prime Minister’s XI cricket match each year. The match is held annually, with an Australian team picked by the Prime Minister playing against a visiting overseas team. While Australia may have regained the ashes in the recent test series, England won bragging rights at last weeks’ Prime Minister’s XI game at Manuka Oval and hence get to claim the Menzies trophy for a year. Sir Robert Menzies began the PM’s XI tradition in 1951 as a one-day match for the visiting West Indian team. He supervised another six of these matches before the series ended in 1965; Menzies retired in 1966. Menzies’ passion for cricket lasted throughout his life, and he used cricket for recreation and as a means to build international relationships. In 1983, another cricket-loving prime minister, Bob Hawke, revived the match as an annual event. 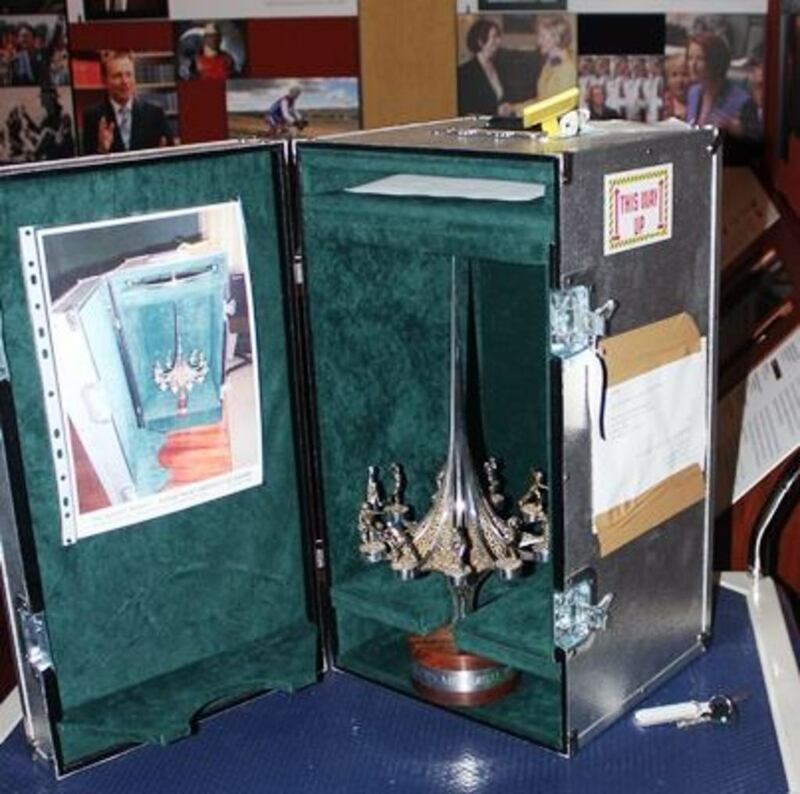 The trophy itself was commissioned by Sir John Bunting, then National Coordinator of the Menzies Foundation, in 1979. It was created by Stuart Devlin, who also designed Australia’s first decimal coinage and was regarded as one of the world’s finest jewellers. 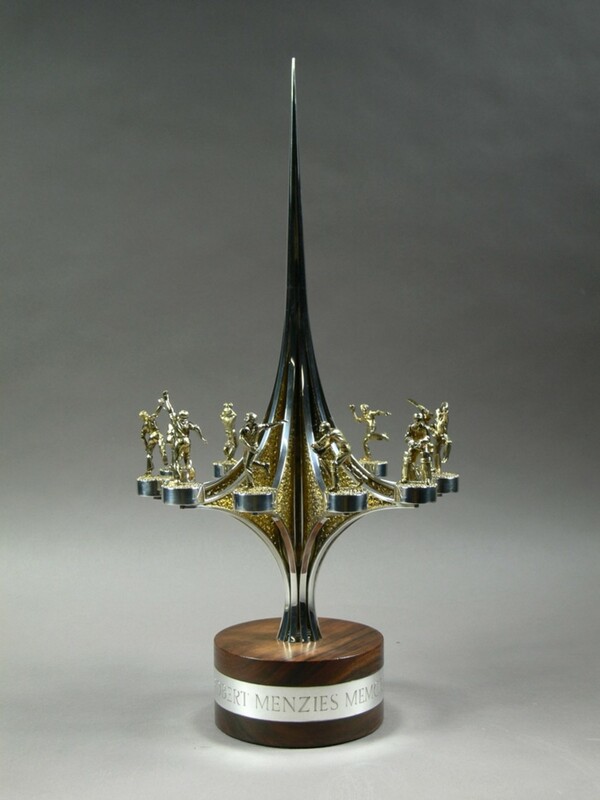 Made of silver and silver gilt, with a rosewood stand, the trophy stands roughly 40 centimetres tall and portrays a team of eleven cricketers in various stances, arranged around a tall spire. On the morning of the Prime Minister’s XI cricket match against England at Canberra’s Manuka Oval, the museum’s Brian Leadbeatter shared some stories about cricket and our nation’s history, with Louise Maher on ABC 666. You can listen to the audio at the ABC’s Soundcloud account. The trophy was on display at the recent PM’s XI match at Manuka Oval. It will return to the museum and be on display here from 21 January. The Menzies Memorial Trophy receiving a polish prior to it being packed up for the PM’s XI cricket match on 14 January. Martin Miles does web projects at the Museum of Australian Democracy. In his spare time he runs Canberra House, a site that tells the story of modernist residential architecture and the development of Canberra.